From his youth, René Portocarrero gave signs of being a great artist; his skills and ingenuity seemed to have no limits. In 1943 when cultural and political figure Guy Pérez Cisneros built an imaginary "Cuban Dance Hall" in order to create a space that would exhibit the avant-garde developments in Cuban modernism, he was thrilled to include the work of Portocarrero, especially his series of cathedrals, angels, some of his banquets, some of his so-called scenes on the Hill. 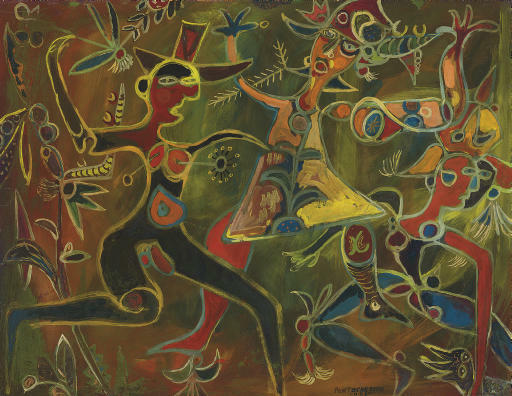 La cacería (The Hunt) is part of a cycle of groundbreaking works produced during the 1940s. At this time, Portocarrero produced a series of Viñales landscapes, still lifes, the "lady portraits" and the "wizards" series. In La cacería, Portocarrero's characters are depicted in various acrobatic moves thus creating a dynamic theatrical space and rhythm. The formal design is magnificent, but the creation of a peculiar ambience is even more noteworthy. In these representations, western mythology and known fables make up a narrative that is whimsically inspired by and based on theatrical or literary worlds. Motivated by childhood recollections of birthday parties and costume balls, La cacería is an illusion of a time gone by against the background of Havana's carnival. Ramón Vázquez Díaz, September 2007.